I looooove seafood and could eat it every dang day but I'm nowhere near the coast. Can you relate? My best options are either visiting a grocery store fishmonger the same day I plan to cook (pricey option here unless there's a specific sale) or stock up on wild-caught seafood that's already frozen. Nine times out of ten, I go with frozen or canned. (Easy tuna patties for the win!) Trader Joe's is my favorite place to grab affordable wild-caught fish like salmon and mahi-mahi since they come in packs with two fillets. If you like buying things in bulk, Costco is another great option. Using frozen fish is budget-friendly and makes meal planning easier. If the fish is already sitting in my freezer, I can pop one of the vacuum-sealed bags in my fridge to thaw overnight or stick it in a big bowl of cold water to thaw about 20-30 minutes before dinnertime. In my experience, frozen fish tends to be more waterlogged, so you have to dry it REALLY well to get a crispy sear on the outside. Sometimes I go through that extra effort, but most of the time I don't. And that's okay! To me, it's more important that the fish is cooked properly and that I'm eating it - period. 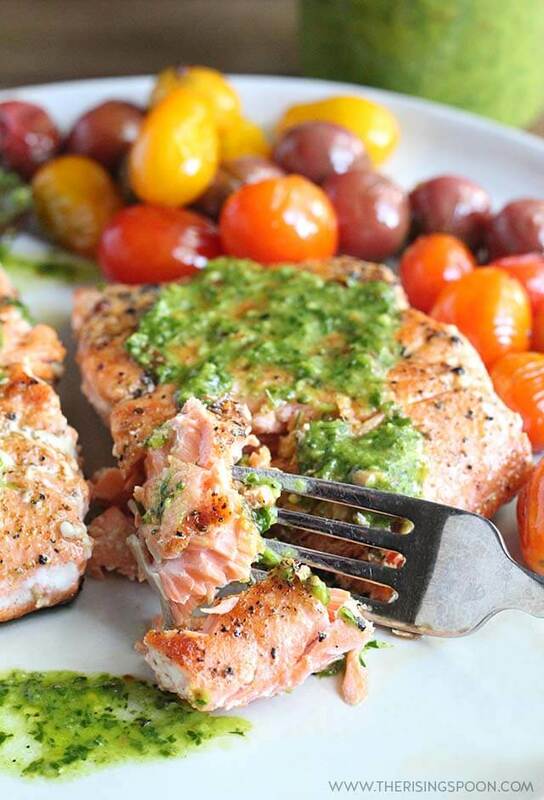 Because fish, especially salmon, is really good for you. Lots of healthy protein and omega-3 fatty acids. That's food to fuel your brain, ya'll! Don't let cooking stigmas stop you. Your fish doesn't have to be caught the same day, perfectly cooked & topped with some fancy sauce. Ever watched an episode of Hell's Kitchen? How often do you think those professional chefs screw up at the fish station? Frequently! All it takes is a little distraction to send it out raw or overcooked. So, give yourself some grace, drop the expectations, and fix all the fish! As I mentioned above, make sure to dry your fish really well once it's thawed. Use some paper towels or kitchen towels to soak up all the excess water. You know what also helps? Seasoning the fish generously with your favorite individual spices or blends. If your seafood is really fresh (like caught that same day by the coast) you can get away with just salt, pepper & a squeeze of citrus. But I find that thawed, previously frozen seafood fairs better with more spices. The sauce of choice for today's recipe is chimichurri. 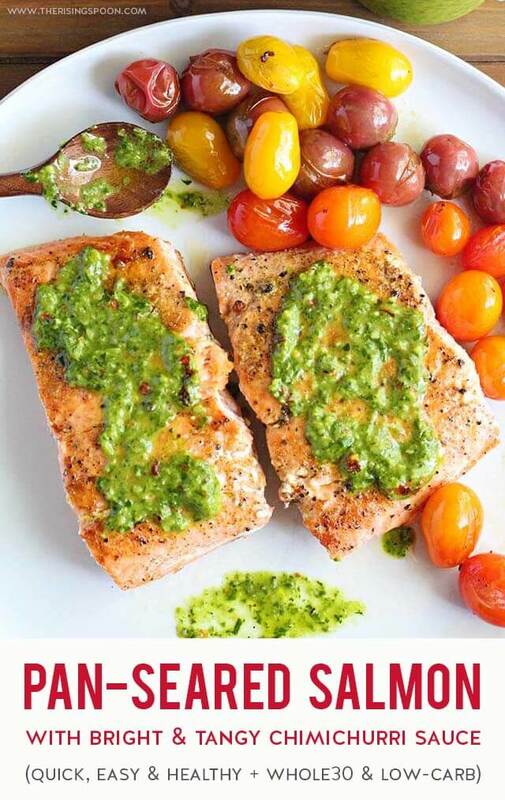 It's a tangy & bright Argentinian herb sauce similar to basil pesto that you can fix in about 10 minutes using fresh or dried ingredients (parsley, oregano, garlic, vinegar, and oil) that are available year-round. 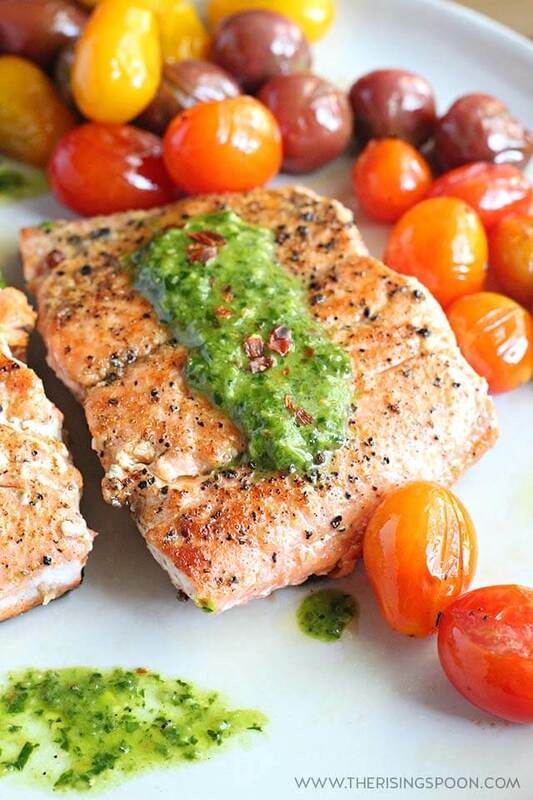 Chimichurri is one of those sauces that tastes good on all the savory things. Salads, cooked veggies, eggs, sandwiches, rice or quinoa, sliced steak, roasted chicken...I could go on. But, it's an excellent option for finishing seafood since it has the acidic vinegar element (like citrus juice). magic sauce from 101 cookbooks (10 minutes) <---I loooove this sauce as a base for pizza crust & typically make it with dry herbs. My favorite way to cook salmon is on the stovetop in my handy dandy cast-iron skillet. To pan-sear salmon (not the same as pan-frying or sauteeing), you start with fish fillets that you've thawed & patted really dry to remove as much moisture as possible. Place a dry skillet on medium heat or medium-high for a few minutes to get hot (don't leave the kitchen while you're doing this), then add enough oil to coat the bottom of the pan (so the fish doesn't stick). Let the oil get hot & shimmery to where it's almost starting to smoke (but not). While the oil is heating in the skillet, coat the salmon in a bit of extra oil then apply the dry spices (the oil helps the spices to stick). When the oil is hot, place the fillets in the skillet skin side down. The skin should not stick if the pan is plenty hot with enough oil. If you're concerned, wait 30 or so seconds and gently shake the pan to see if the fillets move or are stuck. Cook the salmon until the flesh has turned opaque halfway up the fish (look at the side of the fillet & you'll see it go from deep red to light pink)--or about 5 minutes depending on the thickness of the salmon--then gently flip the fish with a large spatula and cook 3-5 minutes more or until the salmon is light pink, flakey and moist all the way through, but not dry. Immediately remove from the skillet, top with chimichurri sauce (or your preferred sauce/toppings) and serve with your favorite sides. 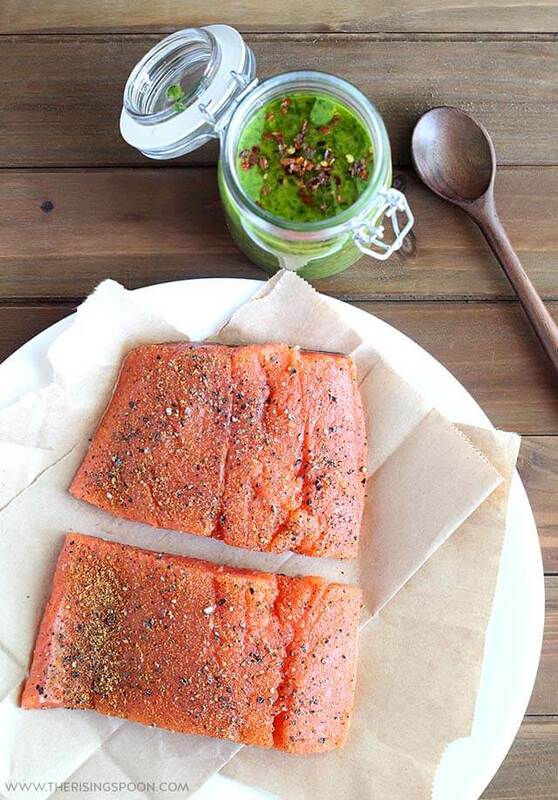 If you have time, let the salmon come close to room temperature before cooking. Just like with cast-iron skillet steak, this helps the meat cook evenly. I don't always do this because of time constraints (like when I quick-thaw frozen fish in cold water, pat it dry & cook it all in one go) but it certainly helps. Use high-heat cooking oil to decrease your chances of smoking. I typically use avocado oil or olive oil because they can tolerate a higher heat, but grass-fed ghee (clarified butter) or butter would also work if the fish fillets are very thin and will cook quickly (like flounder or tilapia). For thicker fish with longer cooking tips, you're better off with a higher-heat oil. Season the salmon right before cooking. If you salt the salmon too early, it'll draw excess moisture to the surface which will get in the way of a sear. So only season right before cooking or a few minutes beforehand. 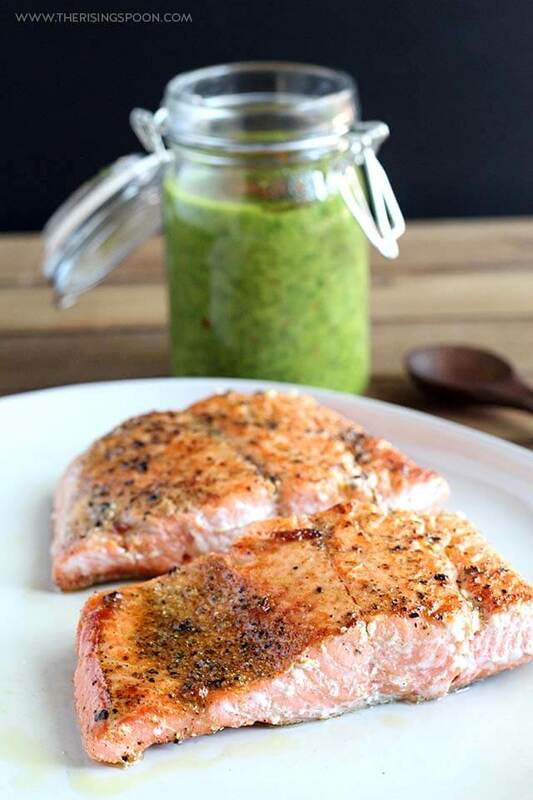 Make a batch of homemade chimichurri sauce by hand or using a blender or food processor (it should take about 10 minutes) and set aside to let the flavors develop while you're cooking the salmon. Place a medium to large skillet (I prefer a cast-iron skillet) over medium heat. When the skillet is hot, add the remaining 1 1/2 tablespoons of cooking oil (or enough to coat the bottom of the skillet). While that heats, coat both sides of each salmon fillet with cooking oil (I used 1 teaspoon total), followed by the sea salt, black pepper, granulated garlic, and your preferred seasoning blend. When the surface of the oil begins to shimmer and looks like it's about to smoke (it should sizzle when the fish is added), add both salmon fillets skin side down (or on either side if they're skinless). Cook the fillets about five minutes on the first side (watch the sides and you'll see them go from deep red to light pink halfway up the fish), then flip and cook another 3-5 minutes (depending on the thickness of the fillets) or until the salmon is barely pink all the way through, but not dry. 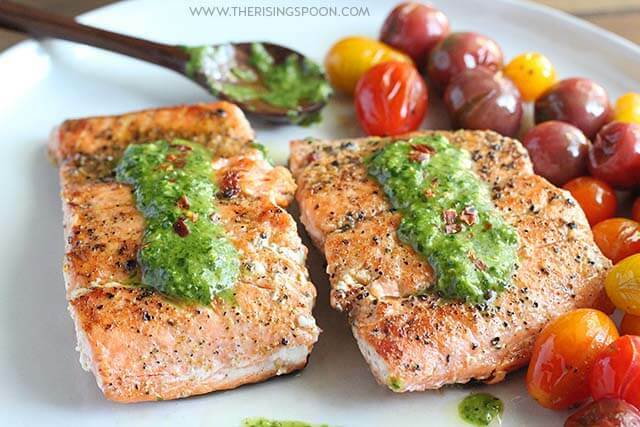 Immediately remove the fillets from the skillet (they will overcook if left in the pan, even with the heat off), top each fillet with a tablespoon or more of the chimichurri sauce and serve immediately with your favorite side dishes. If you want the salmon extra crispy when you sear it, make sure it's very dry before applying the oil and spices. This is key. Another option is to increase the heat to medium-high. This means it'll cook faster on both sides. So, don't walk away or get distracted multi-tasking or you may overcook the fish. For more tips on pan-searing and cooking fillets, see my blog post above. 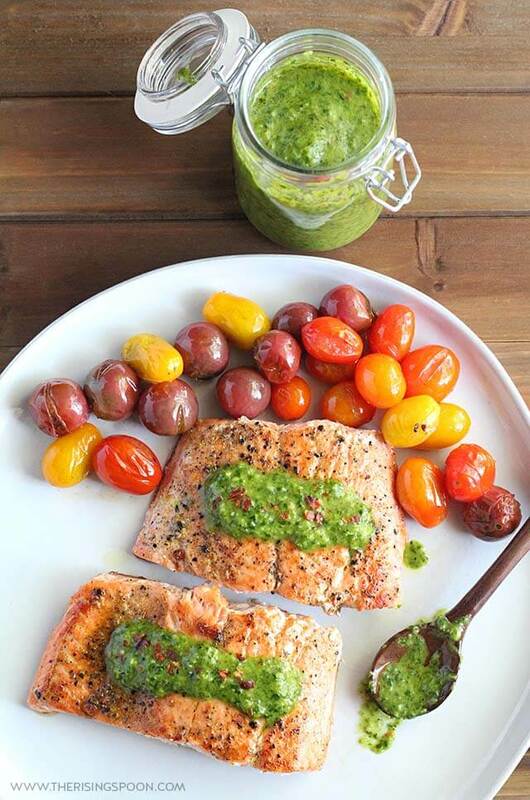 Click Here to Save This to Your Fish & Seafood Recipes Board on Pinterest!